Low-income residents of Detroit and Milwaukee face formidable obstacles to job access. These two Rust Belt regions are consistently ranked among the most segregated in the country, and neither has a good transit system. In both regions, the places that have been growing and adding jobs fastest have been been overwhelmingly sprawling, suburban areas inaccessible to people without cars. A 2013 Brookings study ranked Detroit number one in the U.S. in job sprawl. According to that report, 77 percent of the region’s jobs are at least 10 miles outside of downtown. The national average is 43 percent. Detroit’s woeful job access issues were perhaps best illustrated by James Robertson, a factory worker who commutes to a suburb that “opted out” of the regional transit system. Robertson’s brutal commute went viral, and while it was extreme even for Detroit, it highlighted a disjointed transit network that limits opportunity for many other residents. Milwaukee faces a similar set of problems. As of December 2014, Milwaukee County had only regained 35 percent of the jobs lost during the recession, while outlying counties had regained 70 percent, according to a Milwaukee Journal Sentinel analysis. A 2013 study by Public Policy Forum found that about a third of the region’s 29 major job centers were inaccessible by transit. A local civil rights group recently prevailed in a suit against the Wisconsin Department of Transportation for its continued prioritization of costly highway projects at the expense of vital transit connections. 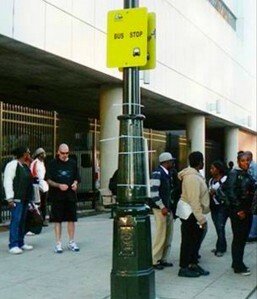 Now, both Detroit and Milwaukee are considering similar measures to improve job access: high-quality bus service that will connect workers from the city to suburban job centers. Detroit’s Regional Transit Authority has a plan to run frequent bus service along major corridors between the city and its suburbs. One route, for example, would run 40 miles between Detroit and Ann Arbor, linking up with the airport on the way. Another would run 27 miles along Woodward Avenue between Detroit and Pontiac in wealthy Oakland County, which has captured much of the growth in the region over the last few decades. Enacting it will hinge on voter support for a tax increase this fall. Milwaukee County’s plan is more limited. The county is opening discussions about a bus rapid transit line from downtown to the Regional Medical Center in the suburb of Wauwatosa, near the infamously expensive Zoo Interchange highway project. Both efforts are still in their infancy. It remains to be seen whether these two regions can overcome political and cultural divisions and embrace a practical solution like fast, frequent-running bus service. What was to be a People Mover from Detroit to Pontiac never made it out of Detroit. Guess who got all the money. 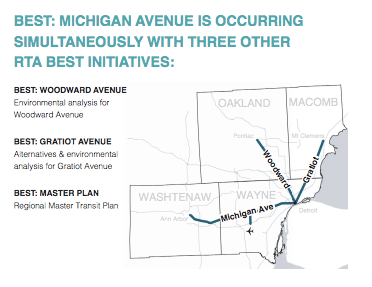 You want to do the people of Pontiac and other communities along Woodward, right? STOP giving money to Detroit for projects meant for Pontiac (aka Oakland County). It’s going to be an important election for the future of the Detroit region. Oakland County, along with Macomb, Wayne, and Washtenaw counties, will also be voting on the tax to pay for better transit access between Detroit and its suburbs. Representing the region's primarily white northern suburbs, Patterson is blocking a transit measure that would improve job access for black Detroiters. By both improving access to jobs and creating new jobs, transit investment can connect people of color to employment.